How to use the Scanner by Vend app for iOS – How can we help? Can I use Scanner by Vend without Signing in? 1. Click the sign in link on the welcome screen, or if you've already used the app before, the Sign In to Vend button on the All Counts screen. 2. 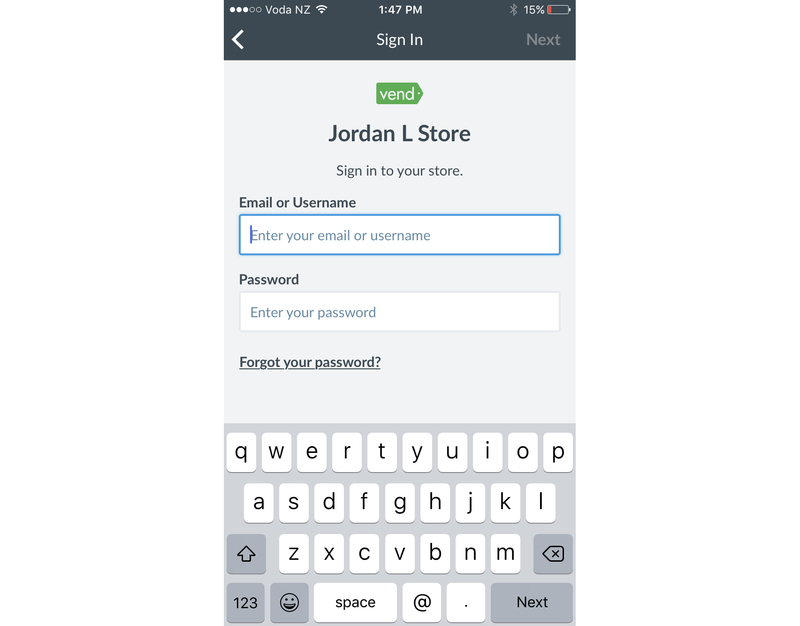 Next, enter your Vend store URL followed by the email/username and password you use to sign in to your Vend store. Just click on any existing counts shown in the Current view to get started OR, to create an Inventory Count in Scanner, click the + button in the top right corner of the screen. Choose whether to Count Now or Schedule Count for a later date. If you choose Count Now you will be asked to name the count and specify which outlet the count will be taking place in. If you choose Schedule Count you will need to specify the future start date and time for this count. 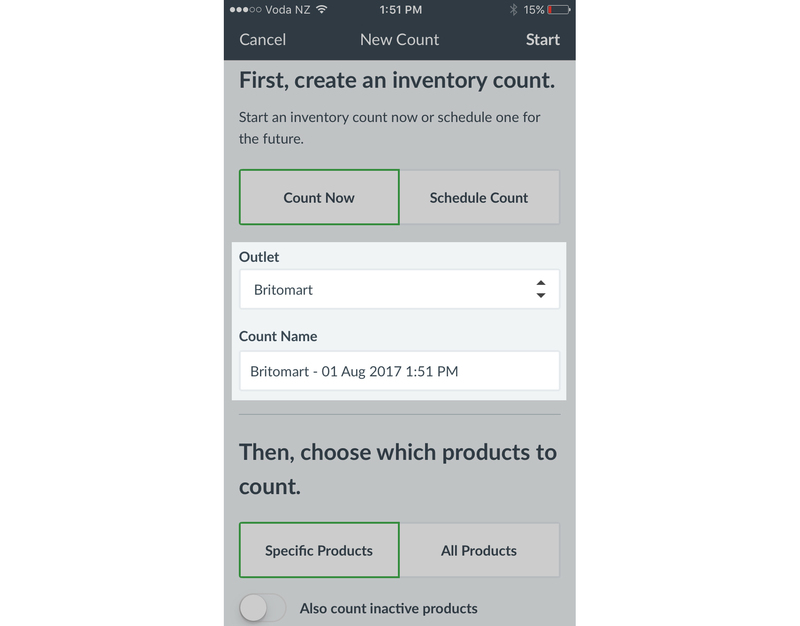 Once you have made one of the above selections, you will then need to choose which products to include in your count. You can either choose to include All Products or Specific Products. 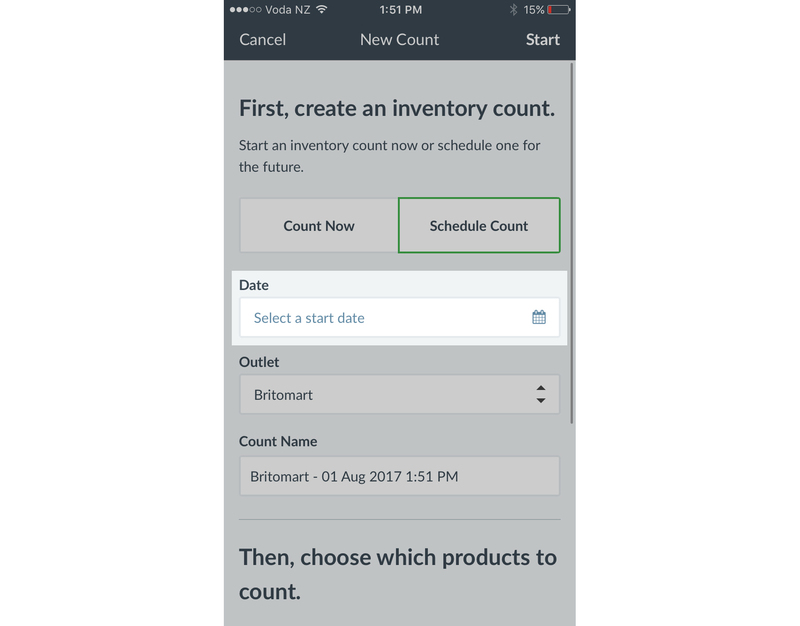 If you choose Specific Products you can specify which products you'd like to include in the count by filtering by product name, supplier, brand, type, tag or SKU. Click Start in the top right to start counting now or Save if you have scheduled this count for a later date. 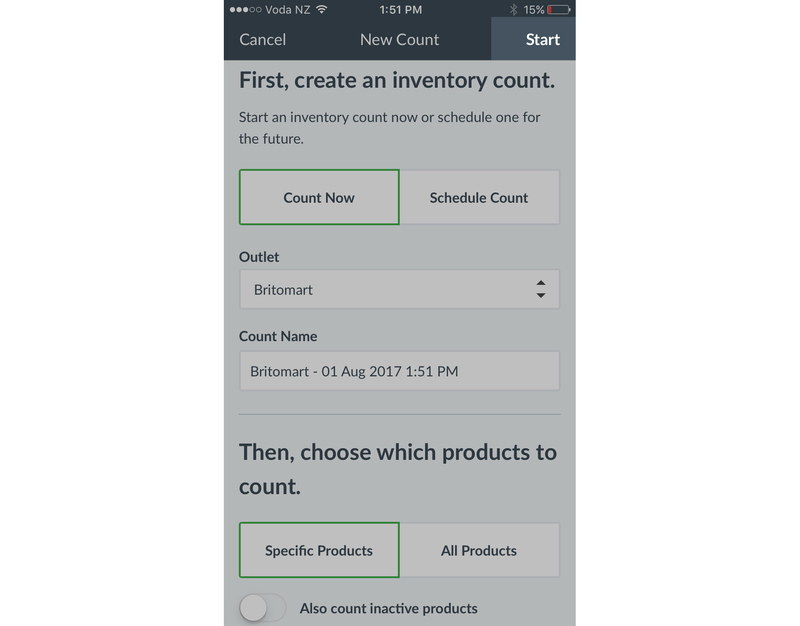 Important: The first time you start a count in Scanner, Scanner will need to process a full sync of your product database. This can take some time depending on the size of your product catalogue but will only need to be performed once. To begin counting products use the in-app camera to scan a product barcode. 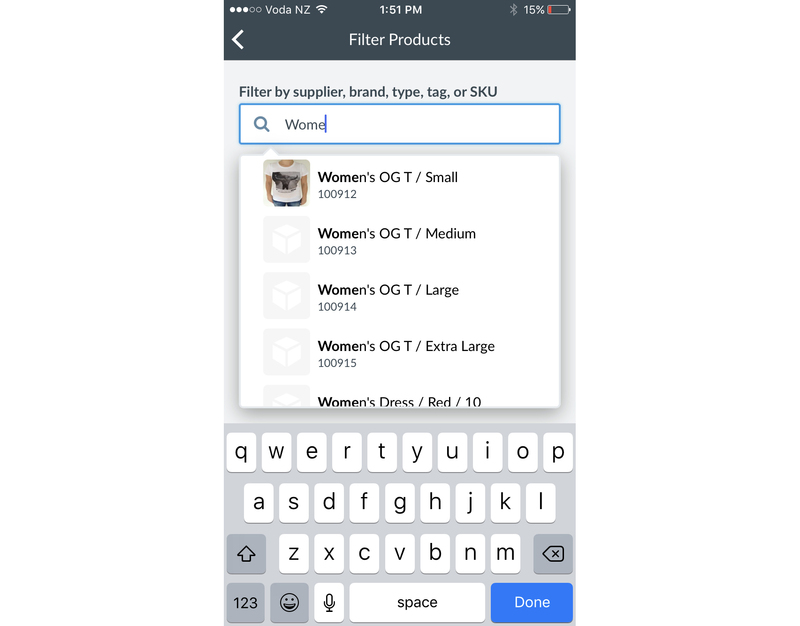 OR search for the product manually using the search icon. You can also manually input the quantity of a product by clicking on it from the list. 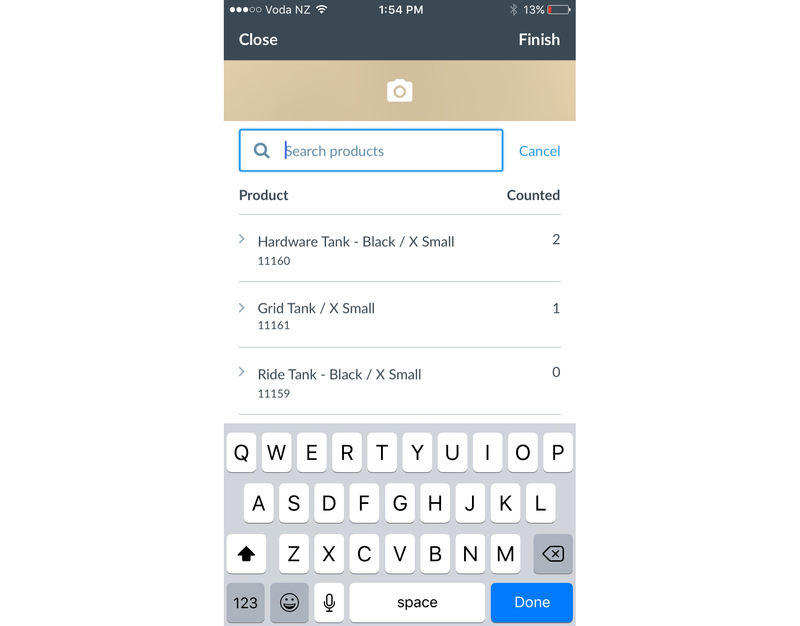 Once you have finished counting all your products, click Finish in the top right of the app. Your count will now be ready for review and approval in Vend. 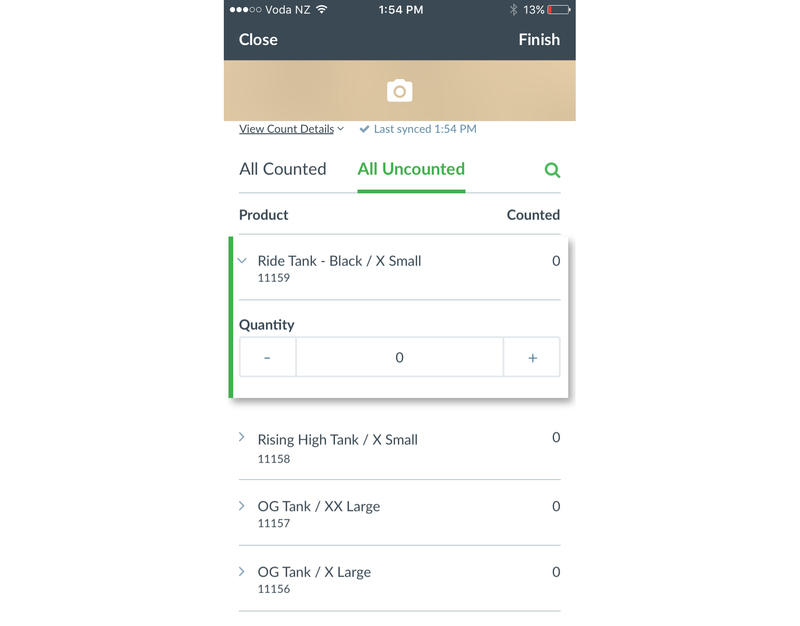 Once your count is submitted, you'll need to review your counted items in Vend on a Mac or PC. 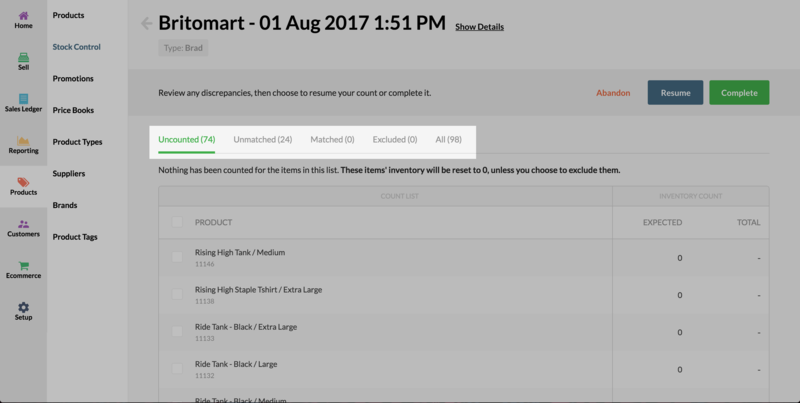 To do this, open Vend on your computer and navigate to Products -> Stock Control -> Inventory Count. Once here, find the in-progress count from the list. Click this count and click review. Unmatched: This lists all items that had a count greater or less than the expected amount. This includes items where you expected a negative amount and counted 0. 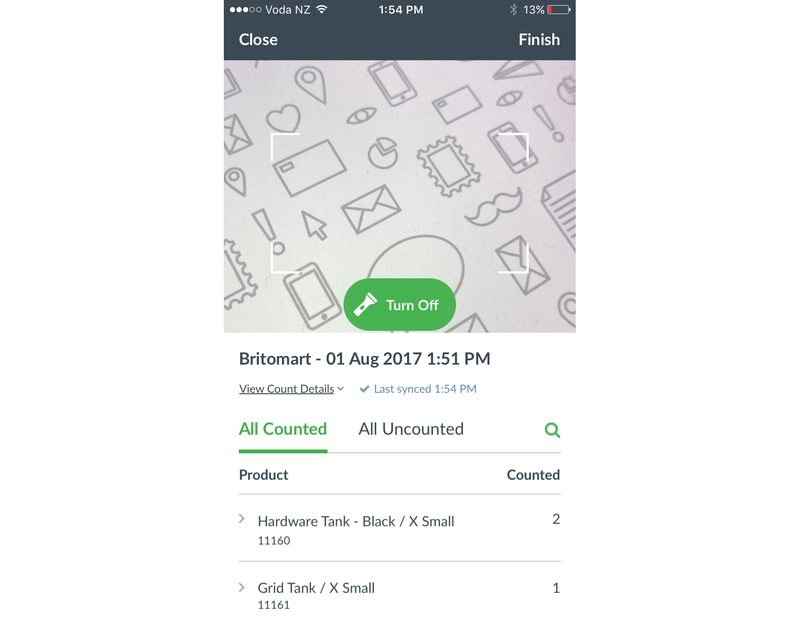 Matched: This lists all items you've counted where the total counted equals the expected amount. Uncounted: This lists all items where the total counted is 0. This includes items with an expected count of 0. Excluded: Any items you manually exclude from your count. Tick the box next to an item, and choose 'Recount items'. This will set the count for these items to zero, so you can count the items again. Click 'Resume Count' at the bottom of the page, and count the items again. At the bottom of the page, you will see the overall unit gain and loss as well as the cost totals. Once you've checked and confirmed your count, and are satisfied all items are accounted for, click 'Complete'. Remember, don't do this until ALL of your staff have completed and saved their counts on their iOS devices. Note: If you have any uncounted items, we'll alert you, as the inventory count for these items will be set to 0 when you click submit. Once you've clicked complete, the count will now show in the completed list in both Scanner and Vend. 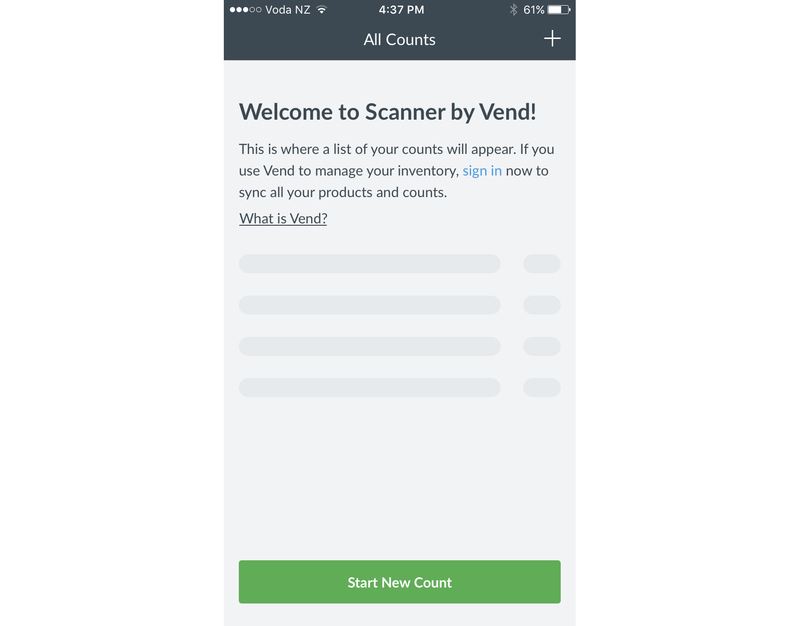 If you use Scanner as a guest user (not signed in to your Vend account), your inventory counts, and product lists will not be synced between Vend and Scanner. You will, however, be able to create and add new products as well as create inventory orders, transfers and returns and export them as CSV files.